As any dog owner can tell you, play time is serious business in most households. With two very intelligent, curious Alaskan malamutes, we are constantly going through toys as they look for something new to manipulate and explore. While they love fancy toys, sometimes the best are those that seem rather simple – including balls and various chew toys. Dogs love creating their own games with these toys, especially if they have a playmate who is just as curious and playful. Unfortunately, sometimes toys don’t last long in our house – because they are intelligent and not afraid to be rough while playing with their toys. This leads to mom and dad both spending quite a bit of time not only researching toys, but giving them a good look over before they ever find their way in our dogs’ mouths. Luckily, we have a few brands that we trust when it comes to toys and are always excited when they have new toys hit the market. When we heard that JW had new toys, we couldn’t wait to try them for ourselves! Looking for toys that are super durable and made from safe materials that are also environmentally friendly? If so, we think you will love the new JW Megalast Glow Toys. Like other toys in the Megalast line, these toys are made from Megalastomer, JW’s own super tough, proprietary material that is not only extremely durable, but made of a material that is safe for all dogs. While these toys float and are just as fun as other toys in the line, they also glow in the dark, allowing dogs and their owners to play outside even dark, giving them extra play time outdoors after work or on a beautiful summer night. These toys not only come in a variety of shapes, but are made right here in the United States. 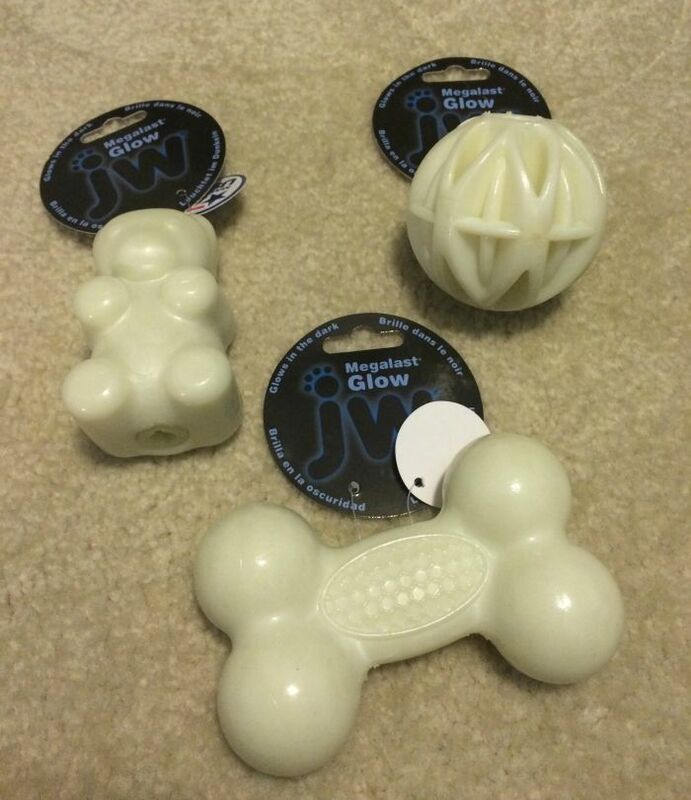 Currently, you can get the JW Megalast Glow toys in one of three shapes – bone, bear, or as a classic ball. You can also find other toys in the JW Megalast line here! I have to admit, these are pretty adorable toys. Our girls didn’t even realize they glowed in the dark until they accidentally rolled the ball under Dad’s desk. The ball glowing intrigued the puppy and she wanted to keep playing with it under his desk. Unfortunately for her, Reya was quick to steal it away, leaving her chasing Reya to get it back and then eventually playing with the bone and bear. The bear, which squeaks, kept her attention the longest and she loves playing pull and tug with it both with Reya and us. To say the least, these toys are really quite durable since the girls were rough-housing with them quite a bit and there isn’t even a scratch on any of the three toys. Based on our own experience, we are delighted to give the JW Megalast Glow Toys an A+ rating! Looking for simple, but fun treat toys? If so, we think you will love JW Hol-ee Bone Toys. These toys are bone shaped with various holes for stashing treats inside, giving your dog hours of entertainment. Not only are they perfect for training, but playing fetch, chewing, toss and tug, or even for helping teething puppies. 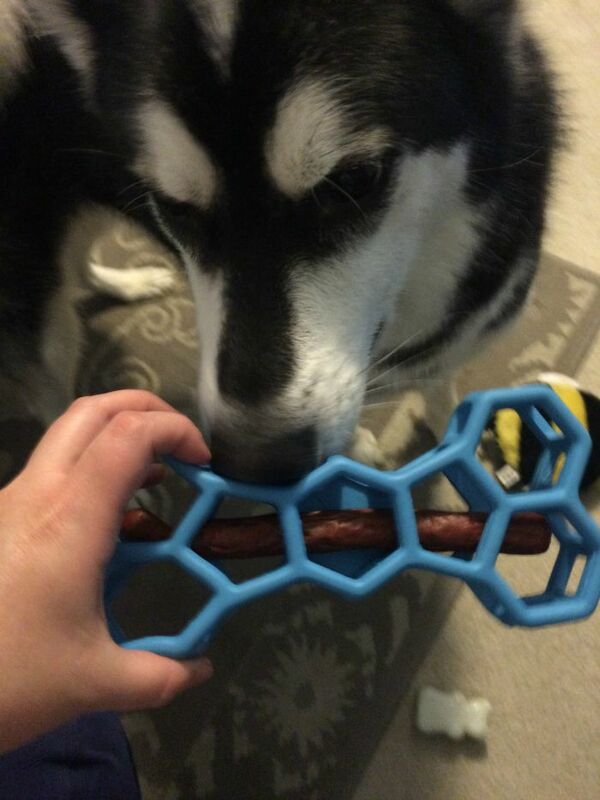 These bones come in a variety of colors and sizes, allowing you to find the perfect hol-ee bone for your favorite pup! Want to see more? You can find other JW Hol-ee toys here! While I wasn’t for sure about this toy at first, I have to say that it sold itself quickly. We stuffed these toys with natural dried sausage and the girls were busy for quite some time trying to figure out how to get the treat out of the holes. Keeping Ivi busy for nearly an hour didn’t shock me at all, but this toy causing quite a bit of a challenge for Reya was a pleasant surprise. She went into her crate on her own, wanting to be alone as she figured out this toy with quite a bit of enthusiasm. Once she did get the treat out, she was quite proud to show us it was gone (or hopeful we would refill it). One thing I do want to note, however, is that this toy shouldn’t be left alone with puppies. We did find that Ivi’s sharp little baby teeth did break the material in one area, though not in a way that let her consume any of it. Even with that little puppy issue, I have to say it is one of the best treat toys we have seen yet for both puppies and adult dogs. Based on our own experience, we are delighted to give JW Hol-ee toys an A rating and highly recommend them to our readers! Want to buy these adorable toys for your own dogs? 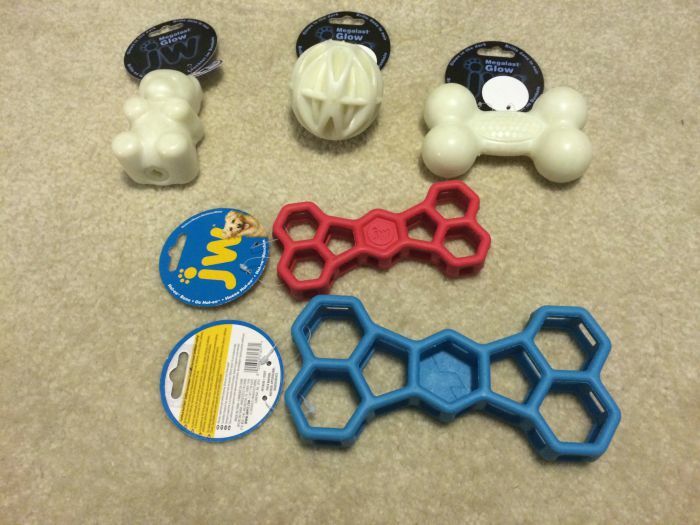 You can find the JW Megalast Glow Toys and JW Hol-ee Bone Toys at a pet store near you using the JW store locator. You can also find these super cute toys on Amazon.com! Want to learn more? Check out JW Pets on social media! I love my dog dearly he deserves these toys. This would make a wonderful gift for a friend of mine. She has 8 dogs! We’re always looking for new, good quality toys for our Golden Retriever. She tends gets bored quickly with some of her toys. I like the idea of glow in the dark. That could be fun. It is hard to buy toys for my dog she tears them apart, but these look like a challenge. I need to check these out for my dog, Artie. He destroys toys so quickly. It would be great to find a toy that can stand up to him. Great toys! I really like how they’re durable. I have some pretty intense players that go through toys very fast. I also love the toys that have holes in them. This would be great for the pup that I have to crate when I’m not home. I love the glow in the dark toys. Very cool! I love jw products. I noticed that they were lasting longer than any other toy. But I haven’t tried these. Thanks for sharing about them. I think my dog will love them. I love the glow toys. My sister has a toy rat terrier and she would go crazy with these. Thanks for the post. 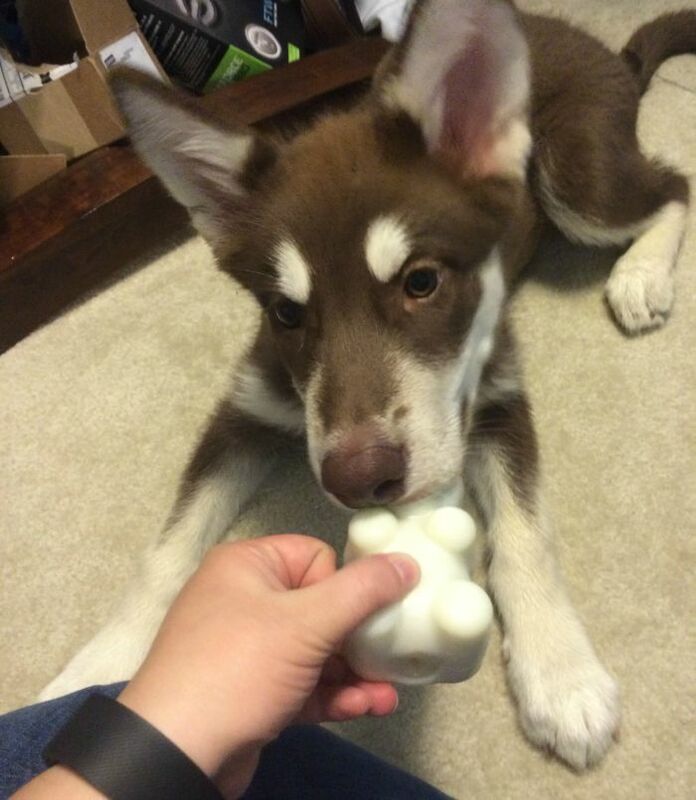 My dogs like rubber toys, but can be picky about the texture/smell…I really think the glow in the dark ones are neat! I can predict some cool play time with that! My dog would love these toys, he has very few favorites he plays with everyday. These toys would be great add to his small collection. My dog would really love these toys. My dogs would absolutely love these!!! I try to find toys they cannot just tear up quickly, these look like they would do the trick. Love the glow in the dark ones. my oldest gal loved these when she was younger but now they are a little too hard for her to play with. i have donated them to a shelter. i do like the glow balls, my youngest loves stuff like this. First, I have to say that Reya and Ivi are absolutely adorable. I’ve told you a billion times, but I can’t help it – I’m a sucker for cute dogs. I love that some of the toys glow in the dark. I don’t think my golden has ever had a glowing toy, but I’m sure he’d love to play with it. And the cat would too, she’s been very intrigued with the dogs toys lately. I do like those bone shaped toys, as well, though I’m not sure what I would put in them, as I don’t typically have any treats that would work with it. Do you have any suggestions? I know you said you used a dried natural sausage. Any specific brand/company? Aww – thanks! We think Ivi and Reya are pretty darn cute, but I know I am at least a bit biased. We personally love glow in the dark toys, but there are only a few brands I actually trust that make them. I worry about them actually being pet safe, but I know Petmate/JW Pets are always trustworthy. As for the treats, we use Jones Natural Chews. Their sausage is actually what is featured in the review and I purchase mine at Pet Supplies Plus. It is 100% natural and made here in the US. I actually met the family who owns and makes it at BlogPaws. Its a little on the pricy side IMO but worth it since I know the meat is human grade and hasn’t been exposed to scary chemicals! I have five dogs, and I know they would love these toys. They look fun and made to last. I think my dog would love these! 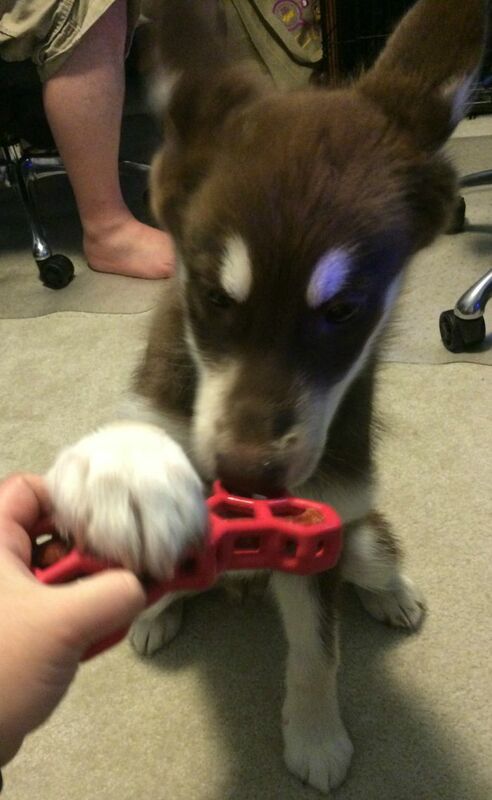 Looks like they would actually hold up to his ridiculous super chewer powers too! Oh my two babies would love those toys. My 7 month old I am sure will enjoy the glow in the dark toys she loves to pick on my other baby at night when he is trying to sleep. 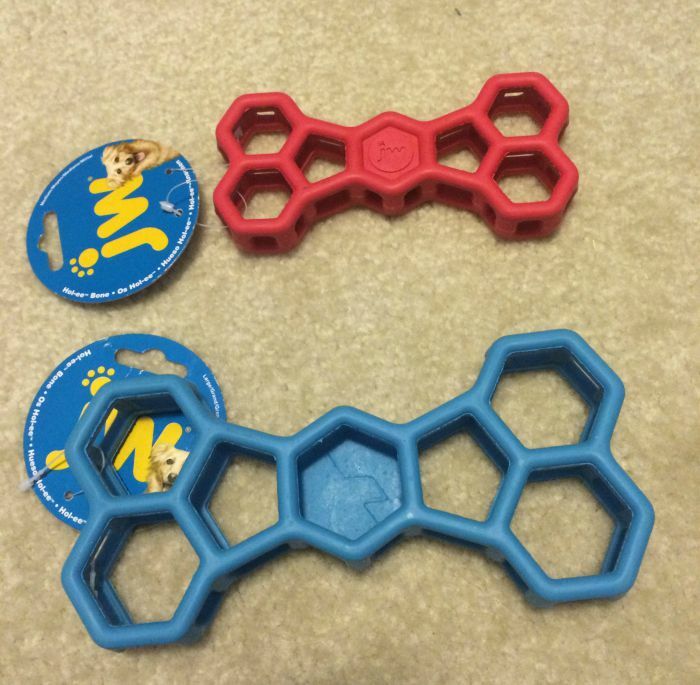 They seem real durable for the pups and I think they would love them. I love the variety and quality factors. Artie likes to play with anything that bounces or rolls so these toy are great for him. Artie and Kouga also love to play tug-of-war and the toys with the holes are a wonderful way to play. I’m sure my dogs will be happy with any toys that they may win.